Casual Shirts: Casual occasions call for simple, comfortable shirts. T-shirts, usually made from cotton fabrics, are always a wardrobe mainstay. They have different necklines and sleeve lengths. They can have graphic designs or just be plain. Polo shirts have buttons at the neck, a collar and are usually short-sleeved. Henley shirts have buttons, but are usually long-sleeved with no collar. 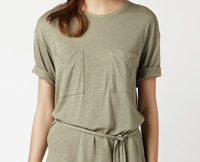 Tunic tops are longer than other shirts and look great with leggings or skinny jeans. They are popular with women of all figure shapes. Casual tops that show more skin include tank, halter, tube and camisole styles. You can layer these tops under other blouses and shirts for added wardrobe versatility. Another casual top is the peasant blouse, with a rounded gathered neckline and gathered sleeves. The camp shirt is a very casual button-down, short-sleeved shirt often found in fun patterns and colors. Career Shirts: Every work wardrobe should contain at least one classic white dress shirt. Influenced by the traditional men's button-down shirt, it is a tailored look which never goes out of style. 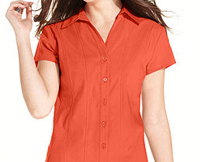 Other button-down shirts for women have feminine details such as pleating, patterns and ruffles. They come in pastels or dark, bold colors. The button-down shirt looks great when paired with dress pants, skirts and suits. Wrap-style blouses that tie at the waist are also a good work look. You can wear sleeveless shirts or camisoles in the office when layered under a jacket or cardigan. Dressy Shirts: Dressy blouses are great for special occasions, parties or dates. They are a good alternative to wearing a dress. You can wear them with dark jeans, a skirt or dress pants. Dressy shirts come in fabrics such as satin, silk and chiffon. They are often lower cut at the neckline, or have open backs or one shoulder bared. They may have beaded trim, sequins, ruffles, lace or fancy buttons. A sheer blouse over a lacy camisole is a popular dressy look.